Takshila Education has been given the authority to administer the President's Volunteer Service Awards to its volunteers. 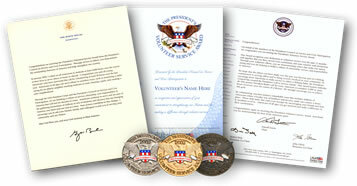 To earn a President's Volunteer Service Award, individuals, families and groups must keep a record of their activities and hours of volunteer service. They can track their hours in a journal at home, on-line through the USA Freedom Corps Record of Service, or through another system that is recommended by their Certifying Organization. Each individual, family, or group then submits its record of service to Takshila Education. Collect and Pay the nominal cost for the award package and its shipping, either directly or through local sponsorship (usually between $7 and $50 depending on the number of awards). In his 2002 State of the Union address, President George W. Bush issued a challenge to all Americans to make time to help their neighbors, communities, and Nation through service. He called on each person to dedicate at least 4,000 hours, or two years, to service over the course of their lives. He created the USA Freedom Corps to help all Americans answer his call to service and help foster a culture of service, citizenship, and responsibility. In 2003, President Bush created the President's Council on Service and Civic Participation to find ways to recognize the valuable contributions volunteers are making in our Nation. The Council brings together leaders from the worlds of business, entertainment, sports, education, government, nonprofits, and the media. The President's Council on Service and Civic Participation created the President's Volunteer Service Award program as a way to thank and honor Americans who, by their demonstrated commitment and example, inspire others to engage in volunteer service. Recognizing and honoring volunteers sets a standard for service to others. It encourages a sustained commitment to civic participation and inspires others to make volunteering a central part of their lives. The President's Volunteer Service Award recognizes individuals, families, and groups that have achieved a certain standard, measured by the number of hours served over a 12-month period or cumulative hours earned over the course of a lifetime. To date, the President's Council has bestowed more than 400,000 awards to the Nation's deserving volunteers. An official President's Volunteer Service Award pin. A letter from the President's Council on Service and Civic Participation. Kids under 14 years old can earn the President's Volunteer Service Award by completing 50 or more hours of volunteer service in one year.